At any given time, but especially when burning tons of calories training for a marathon, I might have 100 or more pounds of fruit in my house. Anyone eating a healthy raw food diet is going to have the same problem. At first I was overwhelmed by the task of managing the fruit I'd purchased. How do you handle things so you don't have periods with no ripe fruit and then periods when you're overwhelmed with so much that it goes bad? Where do you store the stuff? How do you know it's fully ripe? Do some types store better in the fridge? Why are there fruit flies buzzing around? How To Buy Or Find Fruit. Learn how to save money and time by buying in bulk. 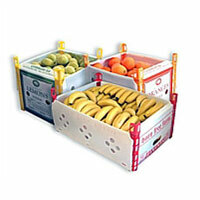 Suggestions for mail order fruit companies. Learn to forage for fruit. What are you going to do with the 50 pounds of unripe fruit you just picked up? Read this guide to learn how to change the ripening speeds to get it ready when you want to eat it. A separate plantain ripening guide is located here. How to select and ripen papaya. How to pick a ripe, sweet pineapple. Pick a great watermelon and avoid the lemons. Where and how you store your fruit can make a big difference. Doing it wrong can lead to slow ripening or more ripe food than you can eat. Read how to handle your fruit here. With hundreds of pounds of fruit in your house, fruit flies can be a problem. Click here to learn how to get rid of them. Integrate info you've found in this fruit guide into a healthy lifestyle.